Check out our fun rain facts for kids and enjoy learning a range of interesting information about rain. Did you know that rain occurs on other planets? Or that Antarctica is the driest continent on Earth? Understand how rain works and why it so important to life here on Earth with our fun rain facts for kids. Rain falls from clouds in the sky in the form of water droplets, this is called precipitation. Water can also fall from the sky in the form of hail, sleet or snow. Rain is an important part of the water cycle. Learn how it works with our page explaining the water cycle for kids. Rain occurs on other planets in our Solar System but it is different to the rain we experience here on Earth. For example, rain on Venus is made of sulfuric acid and due to the intense heat it evaporates before it even reaches the surface! Weather radar is used to detect and monitor rain. Rain gauges are use to measure the amount of rain over a certain period of time. Try making your own rain gauge. The highest amount of rainfall ever recorded in 24 hours is 182.5 centimetres (71.9 inches) in Foc-Foc, La Réunion. This occurred during tropical cyclone Denise on January 8, 1966. The highest amount of rainfall ever recorded in one year is 25.4 meters (1000 inches) in Cherrapunji, India. Antarctica is the driest continent on Earth. Heavy rain can cause flooding and landslides. Rain allows us to create electricity through hydropower. Plants need water in order to survive, they receive much of this water from rain. Forests that experience high levels of rainfall are called rainforests. 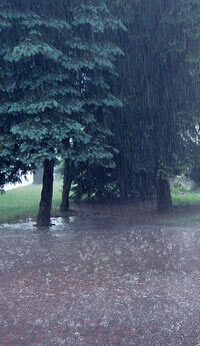 Rain with high levels of acid (a low pH) is called acid rain. Caused by the release of sulphur dioxide and nitrogen oxides into the air (often from factories and power stations), it can be harmful to plants and animals.